London: Ole Gunnar Solskjaer is going through his toughest period as Manchester United manager, just days after getting the job on a full-time basis. 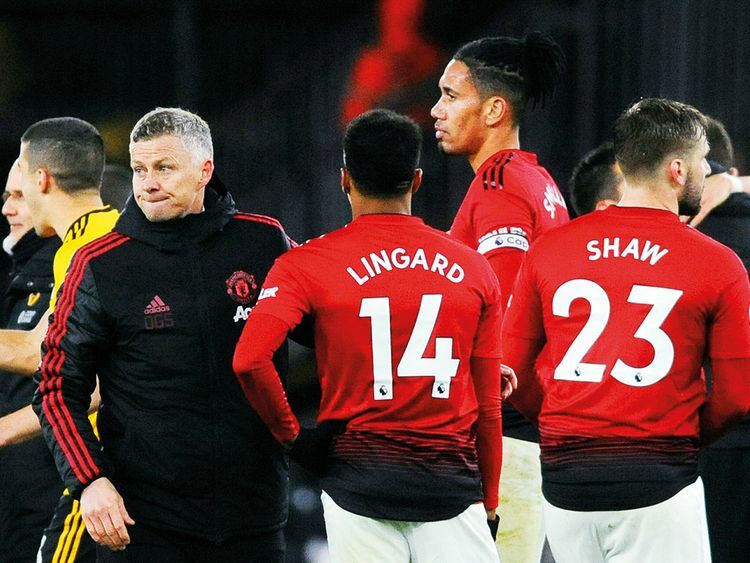 United slumped to a third defeat in their last four matches after squandering an early lead to lose 2-1 at Wolverhampton Wanderers in the Premier League on Tuesday. Two of those losses have come at Molineux, with Wolves winning by the same score in the FA Cup quarter-finals last month. With momentum lost, Solskjaer has work to do to get United into the top four and back into the Champions League. They are in fifth place, behind fourth-place Tottenham on goal difference and two points adrift of third-place Arsenal having played a game more than both rivals. United fell away after going ahead in the 13th minute through Scott McTominay’s first goal for the club. Diogo Jota equalised in the 25th after Fred was caught in possession, United captain Ashley Young was sent off in the 57th for two quick bookings and Chris Smalling scored an own-goal to seal another memorable win for Wolves in their first season back in the top flight. They have now beaten United, Tottenham and Chelsea in the league, were the first team to take points off Manchester City, and claimed draws at Old Trafford, Stamford Bridge and Emirates Stadium. They have also beaten United and Liverpool en route to the FA Cup semi-finals. The team from southwest London succumbed to the inevitable and were relegated with five games to spare after a 4-1 loss at Watford in Tuesday’s other game. United were in control when Fred misjudged a pass out from the back by goalkeeper David De Gea and was dispossessed by Joao Moutinho. Raul Jimenez slid the ball to Jota, who fired past De Gea. For Wolves’ winner, a bundled effort from Jimenez was creeping toward goal but Smalling still had a chance to clear. Instead, the centre-back feathered the ball into his own net from inside the six-yard box. He backed an off-season spending spree of around $130 million and changed managers twice in an attempt to reinvigorate the team. Nothing worked. The loss at Watford was Fulham’s 24th this season. Their goal difference of minus 46 is the worst of any team in the five big leagues in Europe. The 76 goals conceded is also a Premier League high, 17 more than any other team. Relegation was sealed with a heavy beating by a side with one eye on an FA Cup semi-final match at the weekend. Watford took the lead through Abdoulaye Doucoure in the 23rd minute and responded to a 33rd-minute equaliser by Ryan Babel by scoring three times in a 13-minute span from the 63rd, through Will Hughes, Troy Deeney and Kiko Femenia.